Continual red tape preventing the culling of kangaroos across NSW is angering rural and regional farmers. Kangaroos in areas are in plague proportions across NSW. The kangaroos are raiding crops, causing traffic hazards and moving into urban and city areas. Due to a heavy Green influence across NSW and ACT, kangaroos are barely utilised across the state with NSW kangaroo supermarket meat coming from other states due to restrictive NSW regulations. The Rural Land reported that despite a successful culling program in Victoria, which saw some 70,000 roos turned into pet food, land holders in NSW say their hands are tied in an attempt to replicate the program. In Victoria 1378 landholders were issued with what is known in that state as an “Authority to Control Wildlife Permit”. 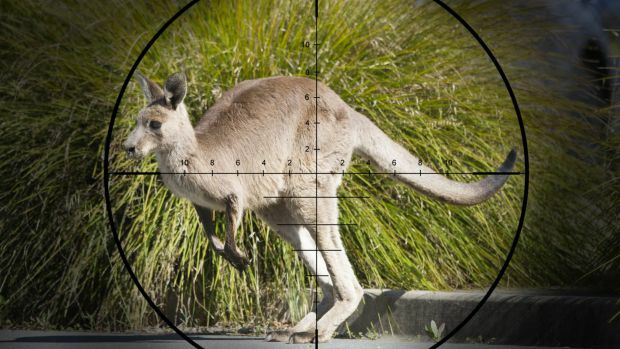 But the act of going out and shooting roos – even on your own property – is far from straight forward in NSW. “It is perfectly obvious that roo numbers are increasing … we are seeing more kangaroos than we did 10 years ago,” said Lockhart Shire Council Mayor Rodger Schirmer. Mr Schirmer said there were opportunities for humane methods to be used in limiting the number of roos. “I (regularly) drive between Lockhart and Wagga and Lockhart and The Rock and you have to be mindful of roos,” he said. ”They are costing farmers money and encroaching on cropping and grazing country and they also compete with sheep on grazing land,” he said. NSW Farmers president Derek Schoen runs a property at Corowa in the far south of NSW. He is familiar with the culling program in Victoria. He said NSW Farmers had a policy that promoted reducing the number of roos and it was discussed at the association’s last annual conference. In drawing parallels with Victoria Mr Schoen said unfortunately NSW didn’t have a processing factory for roos killed here. In fact, kangaroo meat on the shelves of NSW supermarkets is drawn from interstate. Shooters, Fishers and Farmers upper house member Robert Brown said the system of culling roos worked better in Queensland and Victoria. “In NSW farmers apply for what are known as drop tags, they drop the tags on the carcase,” he said. However, under NSW regulations the carcase cannot be removed. He said the regulatory process was difficult for both farmers and hunters. In contrast what is known as a “personal use tag” is issued in Queensland. This potentially allows the roo to be skinned, it’s hide used, and the meat could be fed to pets. “Farmers (in NSW) are faced with a huge amount of red tape … and if they go through the process and are caught doing the wrong thing the penalties are severe,” Mr Brown said.